The hepatotoxicity of acetaminophen is recognised worldwide. Unfavourable prognoses relating to overdose include liver transplantation and/or death. Several hepatotoxicity risk factors (HRFs) should motivate the adjustment of acetaminophen daily intake (to < 4 g/day): advanced age, weight < 50 kg, malnutrition, chronic alcoholism, chronic hepatitis B and C and HIV infection, severe chronic renal failure and hepatocellular insufficiency. Over a 7-day period in Rennes University Hospital in December 2017, using DxCare® software, with an odds ratio estimation, we analysed all acetaminophen prescriptions, to assess to what extent the presence of HRFs altered the prescribers’ choice of acetaminophen dose (< 4 g/day versus 4 g/day). Among 1842 patients, considering only the first acetaminophen prescription, 73.7% were on 4 g/day. Almost half this population had at least 1 HRF. Whereas around 80% of the prescriptions in the < 4 g/day group were for patients with at least 1 HFR, only 53% of the prescriptions in the 4 g/day group concerned patients without HFRs (p < 0.001). Age > 75 and low weight were associated with the prescriber’s choice of dose. Neither chronic alcoholism nor hepatocellular insufficiency influenced the acetaminophen doses prescribed. 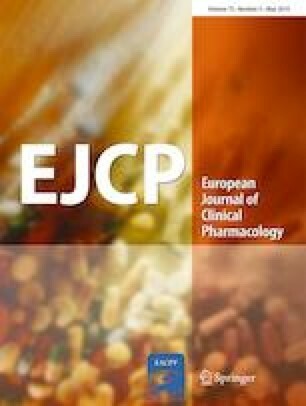 Considering the widespread use of acetaminophen and its favourable safety profile compared with other analgesic drugs, it appears urgent to remind prescribers of the maximum daily dose recommendations for acetaminophen for patients with HRFs, especially those with chronic alcoholism and hepatocellular insufficiency. • Acetaminophen is widely known to be a hepatotoxic drug. • Recommendations include a maximum daily dose of acetaminophen of < 4 g/day for patients with hepatotoxicity risk factors (chronic alcoholism, hepatocellular insufficiency, advanced age, anorexia…). • Studies have described up to 21% of acetaminophen prescriptions without dose adjustment among patients with hepatotoxicity risk factors. • Age > 75 and weight < 50 kg are linked to prescriptions of < 4 g/day. • Chronic alcoholism, hepatocellular insufficiency, severe chronic renal failure, chronic viral infections and malnutrition have no influence on the choice of the dose. • Clinicians should systematically assess patient history, checking for any hepatotoxicity risk factors when prescribing acetaminophen. Administrative, technical or material support was provided by Rennes Hospital University. We thank Jean-Paul Sinteff (Medical Information Departement, CHU Rennes) for the DxCare® software data extraction, and Adrien Turban, Anne-Sophie Michel, Justine Geffroy and Stephanie Ollivier for their help in the data collection. LMS and AB had full access to all of the data in the study and take responsibility for the integrity of the data and the accuracy of the data analysis. SP, EP, LMS and AB were part of the study concept and design. All authors were a part in the acquisition, analysis or interpretation of data. Drafting of the manuscript was done by LMS. All authors took part in the critical revision of the manuscript for important intellectual content. LMS was a part in the statistical analysis. All data was collected in accordance with the French legislation on retrospective clinical studies, in accordance with the precepts established by the Helsinki declaration. 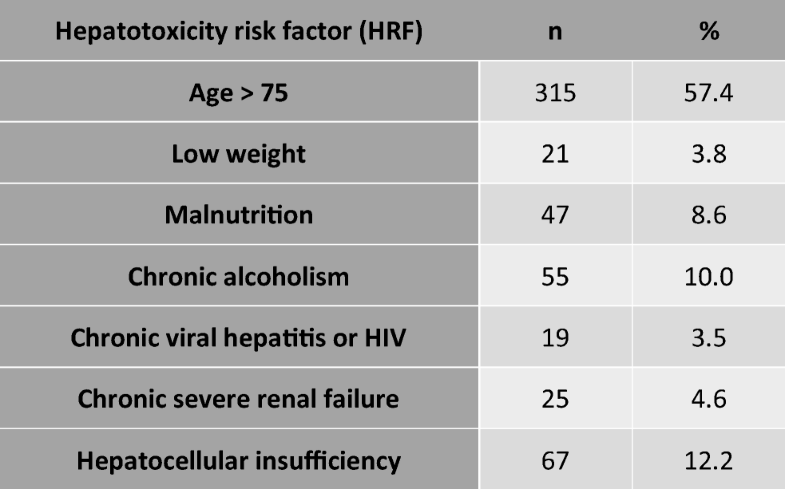 Repartition of patients with only one hepatotoxicity risk factor (n= 549) by type of risk factor. For this descriptive step, we made the hypothesis if a HRF was present it would be clearly specified in the electronic file otherwise it was absent; the missing value were then changed to 0.